Ongoing road works on Ggaba Road have caused a traffic gridlock that has lasted a week now, leaving motorists’ tempers high. 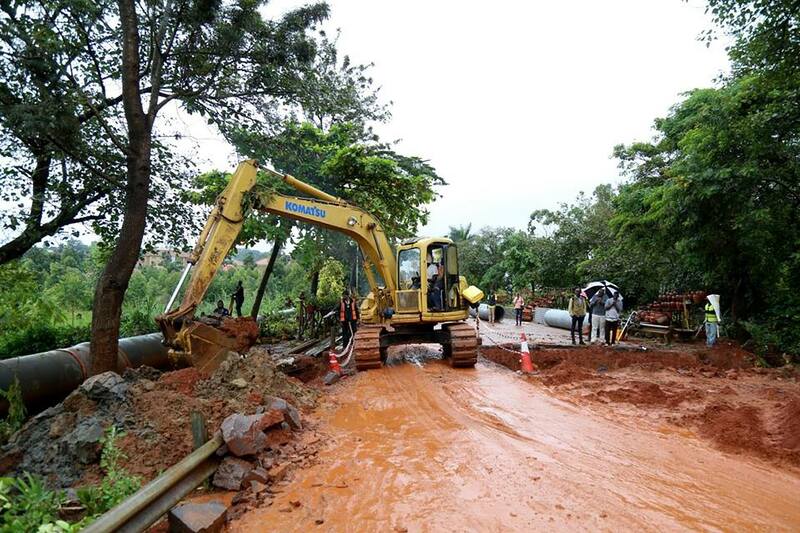 KCCA workers were Tuesday last week forced to turn a section of the road before Bunga as a oneway lane after par to of the road collapsed, leaving a big hole in the middle. KCCA later came out to advise motorists to use alternative routes to avoid delays. “Our team continues to expedite restoration work at the failed section on Ggaba road near the Kansanga drainage channel. We advise you to drive via Soweto, Lukuli and Konge roads. Please bear with this short-lived inconvenience as we work to restore the section to normalcy,” – Jennifer Musisi, KCCA Executive Director. Ms Musisi revealed that the authority are undertaking emergency road works to make the section fully motorable. Government this financial year allocated Shs. 34.9 Billion to KCCA work on city roads. KCCA’s ministerial policy statement of 2018 indicates that a number of interventions have been carried out which have resulted into significant improvement to the infrastructure condition in all parts of the city. The statement states that the interventions have been mainly in form of emergency repairs, routine and periodic maintenance, rehabilitation and upgrading of roads to tarmac standard.